Wands like those below are often used in massage, healing and meditation practices. A variety of lengths and facets of wand are available - all are crafted from natural semi-precious stone. 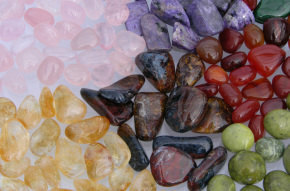 Like all our crystals, we have personally chosen each wand - that way we can be sure the quality is the best available. Each wand comes in its own gift box, along with information about the stone. Whether you select a wand for yourself or for someone special, with the gift box you will always have a safe place for your wand.